Tourism is vital to the East Coast’s local economy. It provides around 1,500 direct and an additional 600 indirect jobs for the region. For the year ended Sept. 2018 we attracted 664,000 intrastate, interstate & international visitors, which contributes $120.5 million annually to the local economy. Our visitor economy extends far beyond traditional tourism businesses that provide accommodation and experiences for visitors. Many businesses are indirectly supported by visitors to our region including shops, service stations, building trades, farmers, training centres, transport, technology companies and more. The East Coast has been identified as one of the most tourism-dependent regions in Australia, so it is vital that we manage the future development of our industry and our natural resources and attractions in a planned, coordinated and sustainable way. Our growth of interstate and international visitors was 1%, which is in parallel with the growth of interstate and international visitors to the state. Of our interstate and international visitors, 81% came to the east coast for a holiday and 13% to visit friends and relatives. 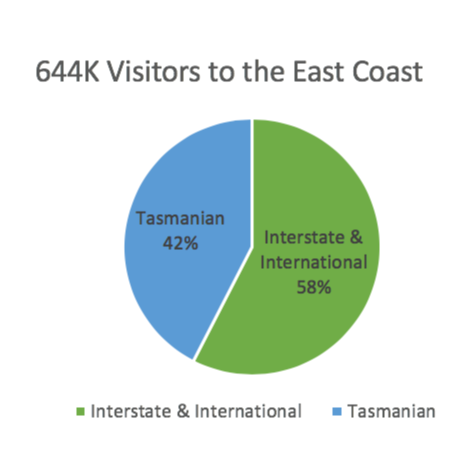 We are seeing Tasmanians travelling more within their home state and they now make up 42% of the visitors to the east coast. 78% of Tasmanians making an overnight trip to the east coast are on holiday. You can view the latest quarterly snapshot from Tourism Tasmania here. You can find more information on interstate and international visitors form the form the Tasmanian Visitor Survey on the TVS Analyser here. There’s also a guide to using the TVS Analyser here. The Tourism info Monitor (TIM) is a regular snapshot of changes in the characteristics, behaviours, perceptions, motivations and intentions of travelling Australians particularly those who are considering travel to Tasmania. TIM identifies the activities Australian travellers enjoy when on holiday – particularly those considering travel to Tasmania – as well as how far in advance Australian travellers plan their trips, their decision-making triggers, and how Tasmania rates against a select range of important holiday features. Tourism Tasmania publishes quarterly reports on the results of the survey to help tourism operators with their marketing and business decisions. TIM is only available to the Tasmanian tourism industry, key industry partners and associations. If you would like to receive the most recent TIM or register to receive TIM via email on a quarterly basis, please complete this form.